A federal jury in San Diego on Friday convicted two former Border Patrol agents of human smuggling in one of the highest-profile corruption cases in the last decade. After a five-week trial, Raul and Fidel Villarreal were found guilty of conspiracy to bring in illegal immigrants for financial gain and other counts. Raul Villarreal was long a public face of the Border Patrol who frequently appeared on television as an agency spokesman. Prosecutors said he started a smuggling ring that brought Mexicans and Brazilians to the U.S. illegally in Border Patrol vehicles and made his older brother and fellow agent Fidel one of his first recruits. Both brothers had pleaded not guilty in a case that was one of the highest-profile corruption cases to sting the Border Patrol since it went on a hiring spree during the last decade. A Border Patrol agent drives his white and green vehicle, above, along the border fence as cars and people cross a road the runs alongside the international border in Tijuana, Mexico, Friday, Former Border Patrol agents Raul Villarreal and his older brother and fellow former agent, Fidel Villarreal, were found guilty of smuggling hundreds of Brazilians and Mexicans to the United States in Border Patrol vehicles. David Nick, Raul Villarreal's attorney, had argued the prosecution relied on witnesses who had a strong motive to lie and surveillance yielded no evidence of wrongdoing by his client. Nick said he couldn't comment on the verdict because of a gag order. A message for Fidel Villarreal's attorney was not immediately returned. The Villarreal brothers are due in court Nov. 16 for sentencing. They face a maximum of 50 years in prison and at least $1.25 million in penalties. Prosecutors say the brothers abruptly quit the Border Patrol in June 2006 after being tipped they were under investigation. They were arrested in Tijuana in 2008. The investigation began in May 2005 with an informant's tip to U.S. Immigration and Customs Enforcement. Investigators installed cameras on poles where migrants were dropped off, planted undercover recording devices, put tracking instruments on Border Patrol vehicles and followed a smuggling load by airplane. The prosecution also relied on accounts of alleged accomplices and migrants who entered the United States illegally, including some who identified Fidel in photographs. One 24-year-old Brazilian woman said she paid $12,000 to be taken across the border in "a police car." 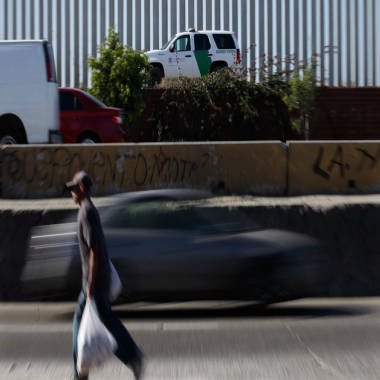 The woman said a police official in Tijuana drove her to the border to a U.S. "immigration police" officer in a white camper. The officer wore a green uniform, hat and sunglasses and drove about 15 minutes before ordering the migrants to wait in roadside brush for another ride to a San Diego drop house. The Villareal family came to the United States from the central Mexican state of Jalisco in 1984, when the brothers were teenagers. Raul knew no English as a 14-year-old but quickly became fluent. He volunteered to read to children at libraries and collected food for the homeless, joining the Border Patrol in 1995 after earning a bachelor's degree in criminal justice from San Diego State University. Raul "pursued and achieved what is known to be the American Dream," wrote Nick. Fidel excelled as a student, got police training at community college, studied aviation at National University and joined the Border Patrol in 1998. His family says he had a habit of calling police to report graffiti in the neighborhood. As adults, the Villarreal brothers lived with their parents and siblings at a house they bought for $140,000 in 1996 in National City, about 10 miles from the border. Letters from family and friends say they were devoted to their parents, a diabetic mother and a father with a heart condition.